September 8, 2017–In the 1980s while working for Rev. Timothy Healy, S.J., then-president of Georgetown University, Mark Dybul, MD, (C’85, M’92) was struck by Healy’s passion for the university’s role in the world. That vision of the university was part of Dybul’s inspiration for returning to Georgetown this July after serving as executive director of the Global Fund to Fight AIDS, Tuberculosis and Malaria and US global AIDS coordinator responsible for implementing the President’s Emergency Plan for AIDS Relief (PEPFAR), which he also helped develop. As the inaugural faculty co-director with Charles B. Holmes, MD, MPH, of the new Center for Global Health and Quality (GHQ) (new window), Dybul will work with top philanthropic, NGO and governmental partners around the world to respond to new and emerging global health challenges and scale up quality services while maximizing resources. resident Bush’s International Prevention of Mother and Child HIV Initiative. In 2006, Dybul was named US Global AIDS Coordinator under President George W. Bush and was responsible for leading the PEPFAR as its chief architect. He served until early 2009 when he returned to Georgetown to serve as co-director of the Global Health Law Program at the O’Neill Institute for National and Global Health Law. 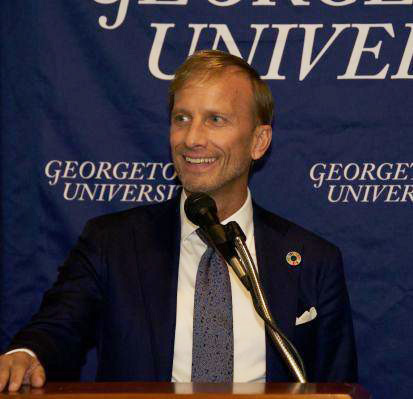 Dybul left Georgetown in 2013 to serve as executive director of the Global Fund, a position he held until May 31. Increasingly, the field of global health is shifting from a top-down approach where donors and experts dictate the terms of programs to implementing countries to a model where all of the relevant parties work together, Dybul said. 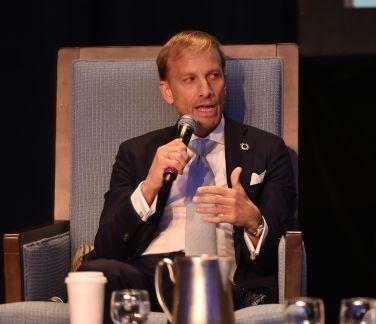 “PEPFAR and the Global Fund have played critical roles in this shift, from supportingnational scale-ups of programs, partnerships rather than paternalism, shared responsibility and accountability at the country level, and building up technical expertise in countries,” Dybul said. Some universities have developed expertise at implementing global health programs but the GHQ is different, Dybul explained. “We are more interested in supporting people in the country to provide the services and establish the systems so that that external support is no longer necessary,” he said. Social justice and service are the foundation of global health and development, Dybul said, and by training students to live those values, Georgetown is in a unique position to make a significant contribution to the field. “I think the university has a role in expanding people’s vision beyond the gates of a university and beyond strictly academic and intellectual pursuits to that spirit in the world and how you can participate in the world, whether it is global health development or any other human interaction,” he said. The university also has the ability to show students that there are many ways to get involved with global health without working in medicine or development. Part of Georgetown’s Global Health Initiative, the GHQ is a multi-disciplinary, cross-campus enterprise that will bring together leaders in the fields of global health, health care, big data, service delivery, economics, program design, international relations, law, management and more.